Bridging the Strategy Management Gap requires selection of the right approaches required to achieve the functional goals of your organization. Many of today’s commonly practiced approaches will make bridging your gap more difficult and in some cases, impossible. Conversely, choosing the right approaches to pursue the achievement of functional goals will bridge your Strategy Management Gap and lead your organization to success. The following table summarizes an organization’s primary functional goals. It also identifies opposing approaches that typically lead to failure vs. success. Most likely, the approaches your organization embraces to achieve the required functional goals will fall somewhere between the failing vs. succeeding extremes. In fact, each area of your organization may operate at different points between the identified extremes as well. What is important is to recognize the approach you are using to achieve your functional goals and to determine if it is the best choice that will bridge your Strategy Management Gap and lead to success. The following section defines each functional goal and reviews opposing approaches that can be used to achieve them. It is intended to help your organization determine which approach you are using. 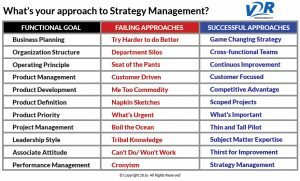 The approaches to Strategy Management that are known to lead to failure are shown in Red. The approaches that lead to success are shown in Blue. Understanding the differences should help you identify the changes required to bridge your Strategy Management Gap and improve your chances of success. Business Planning consists of the highest level plans intended to guide the future direction of your organization. The business plan consists of a Vision Statement, Mission Statements, Core Values and most importantly, a well-defined Strategy. Trying harder to do better is what happens in the absence of a formal plan to improve performance. The old saying “If you always do what you always did, you’ll always get what you always got.” applies here. “Repeating the same actions and expecting a different outcome, is insanity”, is another saying that applies to organizations that do not have a well-defined strategy. Whenever organizations don’t have a well-defined strategic plan that they are committed to achieving, the “Try harder to do better” strategy takes over. This strategy will typically result in the same level of performance as previously attained on a short-term basis, but will result in declining performance over the long run. A Strategy Map is a great way to depict an organization’s concisely defined plan geared to generate a sustainable competitive advantage. Global competitors can quickly erode a competitive advantage by deploying emerging technologies that can clone unique products and replicate proprietary processes. Integrating a number of core competencies that an organization has developed into an overall strategy, is much more difficult for competitors to match than a singular, break-through new product, or cost saving process. The plan to achieve a sustainable competitive advantage can be easily depicted on a Strategy Map. The Strategy Map shows an organization’s custom tailored set of higher level core competencies, which are tightly linked to clusters of lower level tactical plans. The larger the network of linkages between competencies and tactics, the greater chance the organization has to achieve a sustainable competitive advantage. An organization’s structure defines how work gets done. Organizations striving to increase their competitive advantages, must redefine the work that needs to be done. The organization structure must be re-aligned to support the work that needs to be done. The two most common organization structures are hierarchal aligned departments and cross-functionally aligned teams. Traditional organizations are aligned by function, typically referred to as departments. Department Managers are responsible for optimizing every aspect of their department. However, they are usually not responsible for anything beyond their department’s borders. In many cases, optimizing the cost of an upstream process within a department will result in more costly rework from downstream processes in other departments. Global optimums can only be achieved when managed from a system wide, womb-to-tomb perspective. To remain competitive, organizations must develop better products in less time. Customers are also demanding shorter lead times from when orders are placed, until replenishment occurs. These increased demands require a more flexible, matrix based organization structure. Cross-functional teams led by Project and Process Managers will replace traditional Department Managers. Associates will be assigned to multiple project and process teams, reporting to more than one manager. The matrix based organization structure is flexible enough to support these multi-manager reporting relationships. Quality in most markets is no longer a differentiator. Customers are demanding consistent quality. Each market will determine its acceptable quality level. The most common measure of quality is Defective Parts per Million (DPPM). Acceptable quality typically ranges from 0 to less than 1,000 DPPM depending on customer requirements, and limited by supplier capabilities. An organization’s Operating Principle has a direct impact on their quality. The Operating Principle determines the formality by which work gets done. Business processes are used to define the required work. These processes are often referred to as work instructions. They are done sequentially, or in parallel and document the recipe required for converting specified inputs into specified outputs. Process Control is an engineering discipline used to statistically control the output of specific processes within previously defined ranges. Process Control assures the output produced by each process is within its predefined specifications, or tolerances. The formality by which work instructions are documented and managed varies greatly between organizations. Organizations that have poor, or no work instructions are literally run by Seat of Pants (SOP) principles. SOP run organizations are notorious for inconsistent quality due to their lack of formal process controls. Conversely, organizations that embrace continuous improvement operate at the other end of the process control spectrum. These organizations not only have very consistent quality, but are constantly seeking innovative ways that eliminate unnecessary work, improve quality, reduce lead time, and lower costs. The Seat of the Pants (SOP) operating principle refers to processes that exist in the absence of well-defined, statistically validated work instructions. In most cases SOP processes rely on tribal knowledge to produce what is believed to be an acceptable product. Statistics show that the quality from manually controlled SOP processes is only 97% acceptable. This equates to 30,000 Defective Parts per Million, which is totally unacceptable. Organizations that are still relying on SOP processes to control their quality will fail. The only question is “How long can they survive?” in the absence of reliable business processes. The only way to meet increasing customer quality requirements is when your organization embraces Continuous Improvement. The routine portion of continuous improvement assures that all business critical, standard processes are consistently performed within their predefined specifications. Associates must be properly trained on each process and managed to assure ongoing conformance. To survive long-term, organizations must also be able to achieve continuous improvement to their existing, standard processes. Continuous improvement begins with the existing standards. They are viewed as benchmarks from which continuous improvement alternatives can be assessed. The best improvement alternatives should be identified and implemented. When a new leaner process is proven to work, the existing standard should be updated. The new standards must be documented, associates trained and then monitored to assure compliance. The new standards become the benchmark that is used for the next round of continuous improvement initiatives. Product Management sets the direction for deployment of company resources, which if done correctly, will result in profitable growth. Product Management requires a keen understanding of an organization’s core competencies, market opportunities, competitive advantages and existing product lifecycles. Product Management analyzes these key variables as required to support the organization’s profitable growth objectives. Customer Driven organizations are literally driven by their customers. Many customer driven demands don’t make sense, or are too costly to satisfy. The acid test for a customer driven demand is whether the customer’s perceived value is equal to, or greater than, the supplying organization’s cost to satisfy it. A customer driven demand exists whenever the customer’s perceived value is less than the supplier’s cost is to satisfy it. Satisfying unjustified Customer Driven demands cannot result in profitable growth. Customer Focused organizations still place a great deal of emphasis on satisfying customer requirements. However, they will decline Customer Driven demands that can’t be justified. Justification requires that the customer’s perceived value is greater than the supplying organization’s cost to satisfy it. This gap reflects the potential increase in profitable growth that Customer Focused organizations can capitalize on. Product Managers are assigned to develop new products. They must assess many factors including new market opportunities, existing customer relationships, competitive strengths-weaknesses-opportunities-threats (SWOT), core competencies and their alignment with the previously defined strategic plans. A Me Too Commodity is any product, or service that can be purchased from more than one source. A standard practice for most organizations is to approve two or more sources of supply for all purchased materials. Alternate sourcing guards against catastrophic disruption of supply, but more importantly, positions buyers to control purchase costs by creating price wars between approved suppliers. These same organizations when focusing on growth can become enamored with the perceived size of a potential market. Their approval decisions to enter new markets are based on the assumption that If we can just get X% share, we can grow our $Y sales and $Z profit. Unfortunately, in most markets, the existing supply already equals the demand. Exceptions include emerging markets and those where the existing suppliers’ quality or delivery problems may also create opportunities. In cases where the competition is benchmarked and Me Too products are designed and developed, the results will be disappointing, or even catastrophic. The resulting increase in supply, but not demand, will only benefit customers that negotiate cheaper purchase prices by pitting one supplier against another. Incumbent suppliers will defend their positions and aggressively lower their prices. The new entrants will have to offer their Me Too products at prices lower than their original business plans estimated. These lower selling prices will negatively impact the sales and profits for all competing suppliers. Companies seeking to enter new markets, or build new products should always be aware of their planned competitive advantage. We like to use the 6th grader test. Simply stated, you must be able to explain your competitive advantage so that a 6th grader can understand it. Assuming your competitive advantage can be understood and potential customers value it, you have a sound basis for pursuing the new market, or product extension. However, sustainability of the planned competitive advantage must also be considered. With today’s advanced technologies, existing products can be reverse engineered and proprietary processes can be duplicated quickly. Should this occur, the anticipated competitive advantage will be lost, leading to Me Too products and disappointing results. Therefore, new product development should be based on the ability to deliver tangible customer advantages that pass the 6th grader test, coupled with a strategic plan that results in a sustainable competitive advantage. Projects are onetime events that require an assigned manager, project team, defined scope, official start date, ongoing management and an official completion date. The old saying “Measure twice, cut once” applies to projects. Concise scope definitions, followed by actual achievement, are the two most important aspects of any project. The reference to Napkin Sketches stems from half-baked ideas, documented on cocktail napkins, typically authored while drinking. Any project that is started without a concisely defined project scope is referred to as a Napkin Sketch project. Napkin Sketch projects occur because people love to solve problems. They also believe that the time required to better define project scope deters from the time that could be spent solving the poorly defined problem. Napkin Sketch projects result in significant rework, missed due dates, minimal accountability and no basis for performance assessment. The more time invested concisely defining a project’s scope, the better chance there is to achieve the desired results sooner and within budget. All projects should have a qualified Project Manager assigned that has full responsibility for the achievement of the defined project scope. A Project Sponsor may create the preliminary project scope and select the Project Manager. However, the Project Manager remains responsible for selecting the project team they feel is required to achieve the preliminary project scope. The initial responsibility of the selected project team is to translate the preliminary project scope into a concisely defined project that they collectively agree to be held accountable for achieving. Successful achievement of project tasks requires completion of the scoped requirements, on or before their promised due date. Project Priority is used to separate the vital few from the trivial many. The Pareto principle, also known as the 80/20 rule, statistically quantifies that 80% of a standard population can be represented by its top 20% of occurrences. Applied to Project Priority, the top 20% of possible projects should deliver 80% of the total benefit to an organization. Assigning a level of importance to all potential projects is how they should be prioritized. The primary factors that drive Project Priority are anticipated benefit, or return vs. the perceived difficulty, or risk to achieve. Assigning priorities should be based on the perceived absolute and relative values of return vs. risk. In the absence of prioritizing projects based on their relative importance, associates are bombarded with ongoing issues that appear to be urgent. The phone will ring, an email will be received, a team member will request help, something will break, etc. Urgencies may need to be addressed, but only by the associates assigned primary responsibility to do so. Defining the vital few from the trivial many defines what is truly important to work on. Work on important tasks should not be disrupted by less important urgencies. Distractions should not be accepted as excuses for missed promises on already accepted higher priority projects. Project Management is the discipline of organizing and managing the resources required (i.e. money, people, materials, energy, space, provisions, communication, etc.) to achieve a scoped project’s requirements, within budget and on time. High priority, concisely defined projects are the most important to manage and should receive the most attention. Project Management includes all project phases including team selection, planning, management, controlling, status reporting and achievement. The Project Manager’s role is to oversee all aspects of their assigned projects to assure their project team is successfully achieving the scoped requirements. The primary challenge for each project team member is to achieve all assigned tasks on, or before their promised completion dates. Project Management is not the same as Strategy Management. Project Management is project centric, whereas Strategy Management bridges the gap between strategic goals and associate level accountability. 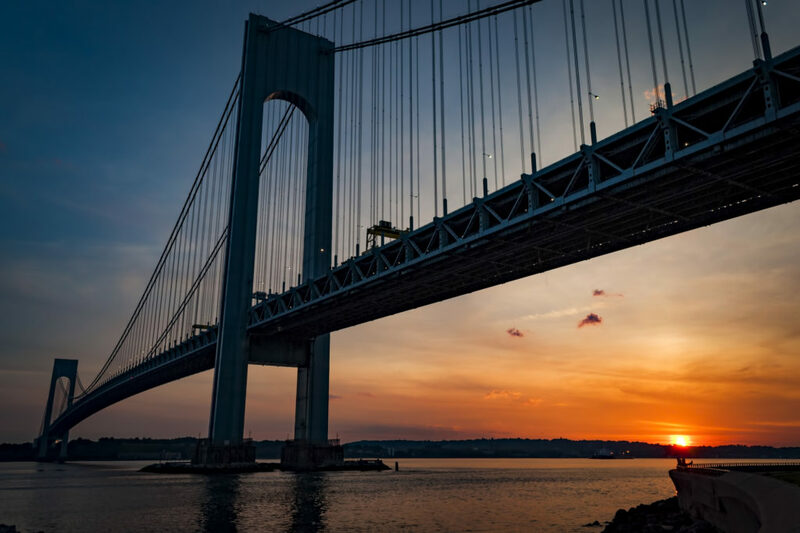 Bridging the Strategy Management Gap aligns an organization’s limited resources with the highest priority strategic projects to assure their success. Simultaneously achieving associate level accountability for timely completion of disparate project tasks is also achieved with good Strategy Management. Project Management and Strategy Management used together will achieve the perfect balance between project centric management and associate centric accountability. Boil the Ocean is a phrase that describes what happens when projects are managed in a sequential fashion. Doing so makes them unnecessarily difficult to achieve. Let’s assume there are multiple dependent phases, or steps that must be completed before a scoped project can be achieved. Following the Boil the Ocean method, the first phase is completed, followed by the sequential completion of all following phases. The problem is that all phases are dependent on one another. Problems can be encountered in any subsequent phase that requires re-work, or correction of previously completed phases. This phased approach often leads to local optimums that result in unnecessary work to downstream phases. Based on the project’s population size, the Boil the Ocean method could also take years to complete before any benefit is derived. Thin and Tall Pilots focus on a small, but representative sample of the population. Thin pilots minimize the work, reduce risk, require less analysis to justify, and increase accountability by shortening the time required to obtain meaningful results. Tall pilots test all sequential processes from womb to tomb at the same time, cut across functional silos, achieve global optimums and avoid costly rework common to the Boil the Ocean method. Immediate benefit can be derived as each Thin and Tall Pilot is completed. Operating Principle defines the formality by which work gets done. Leadership Style is typically aligned with Operating Principle. In “Seat of the Pants” organizations, Tribal Knowledge is typically the norm. When an organization’s Operating Principle is Continuous Improvement, Subject Matter Experts manage their formally defined processes. Tribal Knowledge exists in organizations where “Seat of the Pants” processes are the norm. Tribal experts use hands-on knowledge gained from prior experiences to do their jobs. Although work instructions may exist, tribesmen rely on their past experiences to make decisions. Products produced by tribal knowledge are often outside print tolerances, assuming that current prints even exist. Tribal leaders are often empowered based on their number of years’ service. Unfortunately, in lower level positions, 10 years of service equates to 1 year of experience re-learned 10 times. In other words, length of service may not be the best way to select tribal leaders. Subject Matter Experts (SMEs) exist in organizations where continuing education is recognized and rewarded. Formal training programs, coupled with seminar and tuition reimbursement plans encourage associates to become SMEs. SMEs have PhDs in complying with formal work instructions and driving continuous improvement. Organizations run by SMEs that follow formal work instructions are capable of producing 0 defects, in the shortest lead time and at the least possible cost. Associate Attitude has a huge impact on an organization’s behavior. Positive attitudes breed success, while negative attitudes breed failure. Unlike metrics, associate attitudes are very difficult to measure. However, attitudes are fairly obvious to observe. In “Can Do” organizations, suggested improvements are viewed constructively and encouraged. In “Can’t Do” organizations, suggestions are met with all the reasons why they won’t work. Can’t do, won’t work cultures exist when the critical mass of an organization’s associates remain focused on the past. Typically when tribal knowledge is used to manage Seat of Pants principles, results are disappointing. Disappointing results foster the Can’t Do, Won’t Work attitude. Can’t do, won’t work organizations find continuous improvement almost impossible to achieve. Long-term survival is also at risk when legacy products and dated processes are surpassed by the competition. Thirst for Improvement is a culture that is obviously focused on the future. Organizations that embrace Continuous Improvement, managed by Subject Matter Experts, are well positioned to achieve a Thirst for Improvement culture. Growing the critical mass of your organization to have a thirst for knowledge is a huge challenge. Many associates check their brains at the door, only to plug them back in after work to pursue the things they enjoy doing the most. However, creating a work environment where associates have a thirst for knowledge causes them to turn their brains on when they walk in the door. Performance Management consists of assessing individual associate progress toward achieving measurable goals. Measurable goals can be quantifiable metrics, or subjective goals that are rated by stakeholders. Hopefully both metric and rated goals align with and support the organization’s strategic purpose. Selecting the right associate level goals is challenging. Sometimes a well-intended goal, when taken seriously, can have adverse consequences. As an example, Inventory Turnover can be improved by throwing out good parts. Throwing out any part will reduce inventory, increase cost of sales, both of which will increase inventory turns. Other pitfalls to goal assignment include inaccurate or slow data, focusing on measurement vs. management, having too many non-strategic goals or a lack of accountability. Assuming these pitfalls have been avoided, a root cause analysis that leads to continuous improvement initiatives that are successfully implemented must still be undertaken. On a positive note, today’s ERP systems are capable of providing reams of contemporaneous data that is also very accurate. This quantifiable data, when translated to meaningful reports plays an important role in the Performance Management process. Cronyism exists in organizations where Performance Management does not. Associates with the longest tenure are usually well entrenched in the “Good ole boy network” that drives promotions and pay increases. Cronyism can have a devastating impact on organizations. Often times the worst performing associates are recognized and rewarded. This biased approach can turn the most productive associates off and often leads to them quitting to find more fair and rewarding positions. Strategy Management takes Performance Management to a whole new level. Execution consists of management’s attempt to get their strategic plans implemented throughout the organization. Effective implementation of the strategic plan assures that the organization’s intended purpose is achieved. Efficient implementation of the strategic plan assures that it is done timely and within the budgeted resources. Strategy Management bridges the gap between an organization’s Strategy Execution and Performance Management systems. Integrating an organization’s strategic initiatives, defined by its leadership team to gain competitive advantage, with the “No Excuses” individual associate level goals required to achieve them effectively bridges the Strategy Management Gap. Bridging this gap aligns the associates in an organization and holds them accountable to achieve its strategic initiatives. Vision2Reality is a web based user friendly Strategy Management application that seamlessly bridges the gap between Strategy Execution and Performance Management. Bridging the Strategy Management Gap makes execution of the organization’s strategic initiatives 10x more effective.